Our dog, Perry, died six weeks ago. For the past five weeks, I was writing a post in dribs and drabs about him, my sadness and how I was cranking up the oven in the middle of summer to bake loaves and loaves of bread in which to drown my sorrows. Perry and I were together for over a decade. He saw me through moving to another state, getting married and having a baby. He was a good, old guy. The best. But believe me when I say I am sparing you by not publishing that post. I think writing it was really just for me, a way to muck through my feelings about losing my dearest beast friend. Perry and I back during our days of adventure. Here we are making a pit stop on our way to the Wildflower Triathlon in Paso Robles, CA. He was such a handsome fellow. The thing about being sad is that it's really hard to dwell on it when you are busy. While our family had some down time right at the end of June, things quickly sped up to the point where I've had a hard time keeping the days straight. This is probably a good thing. Our days lately have been filled with trips to San Juan Island and Lummi Island, parades, birthday parties, graduation celebrations, farm camp, nature camp, play dates, potlucks, war canoe scrambles, helping the local triathlon club to put on an Olympic-distance race, and so on. Inside, I can still feel that thread to Perry flutter whenever I have a quiet moment. I miss him. No matter what, he had the ability to shake things off, live in the moment and feel joy in the little things, like having his ears scratched and his belly rubbed. Or, taking a quick walk through the woods. I've decided to honor him by moving forward in that spirit, trying to keep it simple and enjoying the small moments. In the Garden of Beasts by Erik Larson - Pre-WWII Berlin, Hitler's rise to power. Regeneration by Pat Barker - WWI, the effects of trauma on British soldiers and officers. Truly, one of the most outstanding books I have read lately. Ms. Barker, you certainly outwrite the best of them. About a Boy by Nick Hornby - Not exactly breezy, but so funny and filled with heaps of pure heart. About how friendship and connection from unexpected places can transform you. Like others around here, we've also been getting out to see friends. With summer being so much about backyard barbecues and potlucks, I thought I'd include a salad that we've been eating a lot of lately. It's from my all-time favorite cookbook, Tessa Kiros' Falling Cloudberries. I love salads that contain both cooked and raw elements like this one. It is so full of freshness and flavor. I hope you'll try it and even bring it to your next get together. May your summer be full of friendship, love and well-constructed salads. Here's to holding onto memories of our dearest friends past and present, enjoying small pleasures and reveling in the simple moments. Cheers! The herbs here add a fresh punch while the chickpeas and feta make it savory and satisfying. You can cook the onion-and-garlic mixture a day or two ahead. If you do that, you can throw the dish together in no time. The salad also keeps well for a couple of days once it's made. I've mostly just made adjustments to the quantities of the original recipe so that it could feed more people. Otherwise, it's pretty true to the original. Serves 12 as a side dish. Drain and rinsed cooked/canned chickpeas. Place in a large bowl and set aside. Heat 3 tablespoons of the olive oil in a medium skillet and saute onions. When they become translucent and are starting to take on a golden color, add salt, garlic and chile flakes and cook for another 1 or 2 minutes. Remove from heat and allow to completely cool. Add onion and garlic mixture to the chickpeas, stirring together. Add feta cheese, scallions, parsley, cilantro, lemon juice and remaining olive oil. Combine gently. Taste and adjust for salt. Add black pepper to taste. Serve at room temperature, or cold. We've officially reached that part of the summer where I don't feel like cooking. The weather's been too nice. We've had birthday parties to go to and trips to the berry farm to make. I've been trying to get ahead by washing and prepping produce and ingredients in clusters rather than separately each day. This means that on Thursdays, when our CSA box comes into the house, I will wash and dry lettuces, dark greens like kale and chard, roasting all the things that want to be roasted (such as beets, carrots, potatoes), wash and chop things like green beans and put together any sauces or dressings that can be made ahead of time. In her very soothing and reassuring book, An Everlasting Meal: Cooking with Economy and Grace, Tamar Adler has a helpful essay about cooking in this manner. In fact, I found a lot of inspiration for making practical adjustments in the kitchen thanks to her book. She describes many of her very sensible methods, such as taking washed lettuces and laying them flat between layers of paper towels in a roasted pan then covering the whole thing up with plastic wrap. That's a bit more than I am capable in the summer months (I know! Lazy, lazy! ), so I just toss my lettuces into a clean produce bag, stuff a couple paper towels in there willy nilly, and put it in the fridge bin. This lazy person's method has worked out just fine for me. When it comes to what to deal with first, herbs are always the thing, especially the soft-stemmed types like basil and cilantro. Cilantro and parsley bunches get shoved into mason jars with a couple of inches of water at the bottom. A sandwich bag usually gets slapped on top of the leaves. I find that basil can hardly stand to be in the fridge for more than a day before the edges start blackening. So I deal with that as soon as possible. 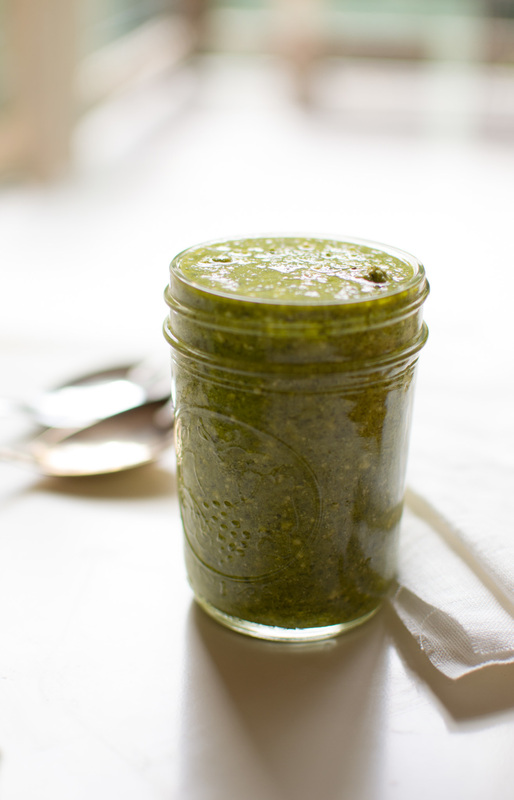 If I have a large quantity, I will turn it into pesto or this caesar-inspired salad dressing, without the anchovies. This dressing is the perfect thing to have in a big jar for whenever you do decide you need to eat something, anything now. Like, say, a green salad with some beets you've roasted. After you've dabbed on some dressing, fling on some walnuts that you wisely toasted earlier in the week. Lunch? Done. If you have a piece of fish, perhaps a nice bit of sockeye, cook it in a pan with some butter and oil, spooning the fat over it while it cooks for about 6 or 7 minutes. Then flip it over and let the heat just kiss it. When you put it onto your plate, spoon some of this dressing on top, and you'll be the happiest lazy summer cook around. Enjoy the rest of these hot, lazy days. They are fleeting! 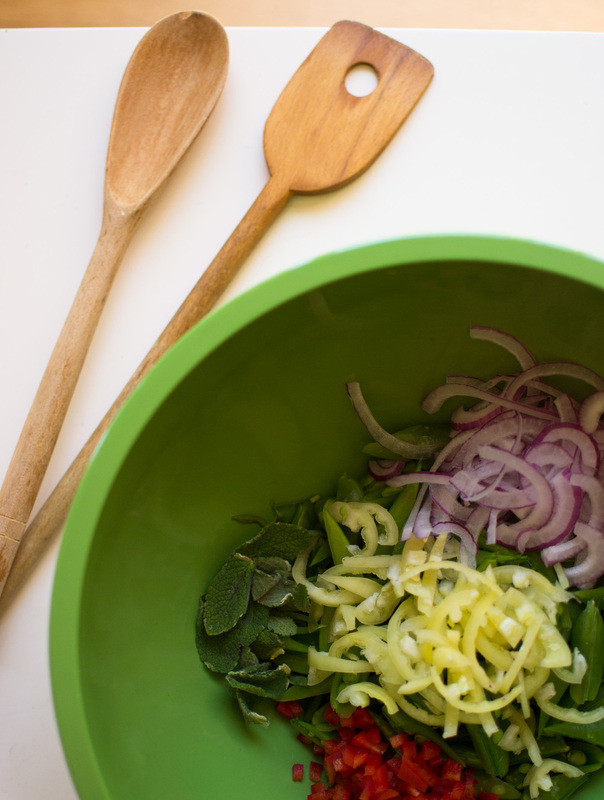 In a blender or food processor container, place garlic scapes, mustard, lemon juice, vinegar and basil. Pulse to combine. Scrape down sides if needed. While machine is running, slowly add olive oil. Stir in parmesan, add salt and pepper, adjusting to taste.